I love marshmallows, but they always come in a plastic bag, a zero waste no-no. I’d managed to go four long months without marshmallows, but our first warm evening just begged to be celebrated with marshmallows roasted over a backyard fire! This is the first time I ever made marshmallows, and I’m so happy with how they turned out! These pillow-soft, powdery marshmallows are to die for—and so much better than the store-bought variety. Plus, there are no hard-to-pronounce ingredients in them. 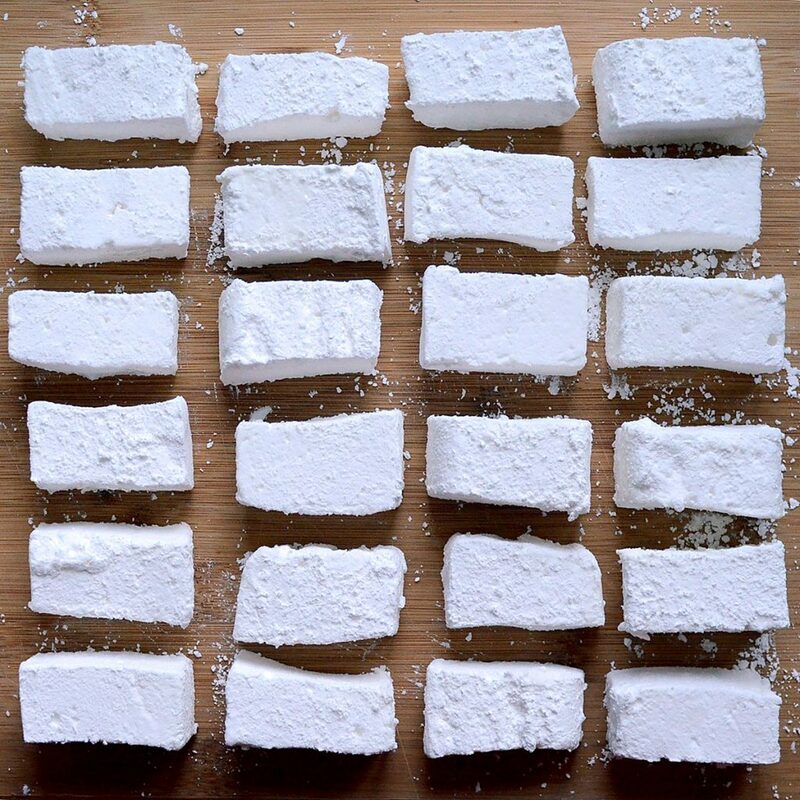 I made these marshmallows zero waste by buying all the dry ingredients in bulk except the gelatin powder, which I found in paper packets in a cardboard box, and by getting vanilla extract in glass instead of plastic. 1) Grease a 9″x13″ glass baking dish (or 9″x9″ for taller marshmallows like those pictured above) with vegetable shortening and set aside. 2) In a small bowl, soak gelatin in 1/3 cup cold water and set aside to swell for 10 minutes. 3) In a large saucepan, dissolve granulated sugar in 1 1/2 cups of water over low heat, stirring constantly. 4) Add the swollen gelatin and dissolve. 5) Raise temperature and bring to a boil. Boil steadily, but not vigorously, for 15 minutes without stirring. 6) Remove from heat and allow to cool until lukewarm. 7) Pour into mixing bowl, add vanilla and beat mixture until very thick and white. 8) Let set for several hours in the fridge (I used the top shelf so I wouldn’t have to cover it). 9) Put cornstarch and powdered sugar into a large glass bowl with good-fitting lid. Wet a knife with warm water to cut marshmallow into squares (re-wet between cuts). Drop a few marshmallows cubes into the bowl at a time, close lid and shake to evenly coat marshmallows.